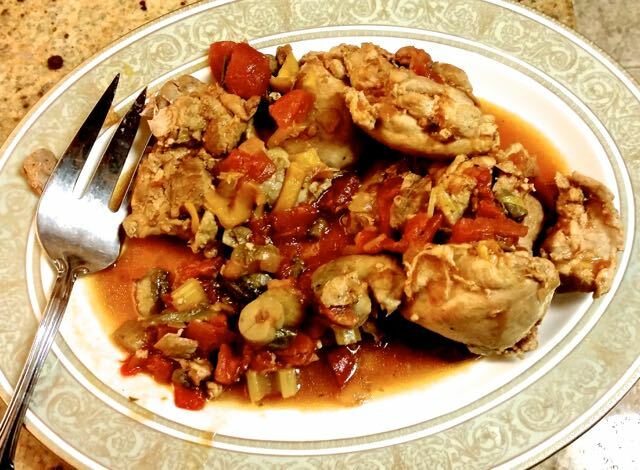 The very first dinner I cooked for my husband of almost 50 years was chicken cacciatore, learned from my Irish mother who learned it from her Sicilian mother-in-law, and it has been a favorite dish at our house ever since. I replaced my family recipe with this one when Dunloggin neighbor Joan Lucco brought it over as I was recuperating from a serious illness, so it always reminds me of the value of friendship. I do NOT recommend skinless boneless chicken breasts in this; they come out a little dry. You might be able to use them if you cook the sauce a lot first and then add the chicken for the last 15 minutes or so, but I haven't tried that.